Fresh from their screen to stage debut of Meet the Adebanjo’s at Catford Broadway Theatre earlier this month, MtA productions have announced their collaboration with fellow online success stories Don’t Jealous Me and Venus vs Mars with the world premiere of A Cup of T and the season one finale of Venus vs. Mars. Andrew Osayemi, MtA Productions: “This is an important event in taking black UK talent and content to the next level. We launched Meet the Adebanjo’s online, made it to television and now theatre. We want to give our expertise to other creators and encourage them to think about models other than giving their content for free”. On July 26 in London’s Leicester Square, the home of film premieres, Prince Charles Cinema will host the world premiere of A Cup of T - one of the most hotly awaited shows of 2012. 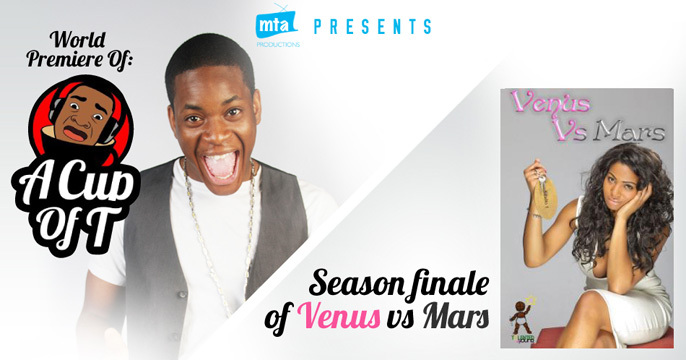 Together with the season finale of smash television series Venus vs. Mars this is a night not be missed as we celebrate the phenomenal achievements of these productions. Tolu Ogunmefun, A Cup of T, who is best known as the Internet comedy sensation, Mr Don't Jealous which has had over 20 Million YouTube views, said: “I’ve always believed that when you consistently work hard, you will always achieve your dreams, no matter how many setbacks you have. I’m extremely excited about the premiere. This is just the beginning of bigger and better things and hopefully you will see me in big movies like my uncle, Will Smith. So I want to see you all there. This is my first screening and this means a lot to me. We are going to party like crazy so come and join me in the popping of Fanta”. This exclusive industry event will be an occasion filled with the stars from both shows and specially invited guests. Prior to the screening there will be a special Q&A with Tolu Ogunmefun [A Cup of T] and Baby Isako [Venus vs. Mars]. An after-party at Metra Night Club, Leicester Square, follows the screening with DJ Cautious of Too Cold on the decks. Baby Isako, Venus vs. Mars who was featured in The Guardian as the future of television, said: “I'm so excited about the screening of Venus vs. Mars and for MTA for giving us this experience. Hopefully this night will open more doors for Venus vs. Mars. The excitement the whole cast is feeling is overwhelming”. This is a strictly an invitation only event with just 75 tickets available to the general public. Ade Omideyi who stars in A Cup of T, said: "I'm completely ecstatic about the launch of A Cup of T! I believe the series will redefine urban comedy!"